Because of my pink leg I haven't been able to play properly in the sandpit. 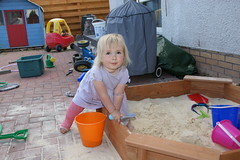 Mummy did try dungarees and tights to keep the sand out of my cast but it still got in. Today Mummy took me to the hospital and a nice lady called Natalie sawed my pink leg off with a noisy saw. It was tickly and made my leg shake. Lots of sand and grass fell out of my pink leg! Then she gave me two stickers for bravery. I can walk now and more importantly I can put on two socks and two shoes. I have found it very unsymmetrical and upsetting going out in one of each for the last three weeks. Now I can play in the sand and the paddling pool again but first thing I tried when I got home was a wee jump on my little trampoline (though I won't be going on any big trampolines again). Then Mummy made me have a very long bath - I think she's been thinking washing me once a month isn't enough - especially since I drew all over my arms in permanent marker yesterday when I was bored!